H2R Design showcases its versatility in designing two diametrically opposite facilities: a pizza outlet and the revamp of a celebrated hotel of the 1960s. H2R Design, a young and dynamic design studio that is behind some renowned commercial and hospitality spaces in the region, has added two distinct clients to its growing portfolio: an international pizza chain in the UAE and a resort hotel in Egypt. 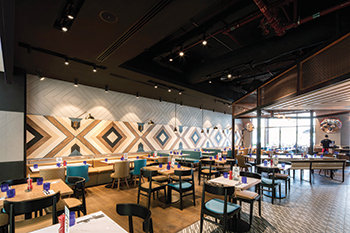 When global pizzeria franchise Pizza Express entrusted H2R Design to design a restaurant in Matajer Shopping Mall, University City Sharjah, it wanted something that would stimulate minds and satiate the hunger of diners. The project was completed and handed over earlier this year. H2R Design approached the project with the theme of curiosity for knowledge and good taste, according to Hasan Roomi, who founded the London/Dubai-based practice along with his brother Husain. Pizza Express ... featuring wall lights in the shape of test tubes. The design was an academically-inspired version of the popular pizzeria that holds on to the restaurant’s playful attributes. H2R Design was tasked to propose a design concept that remains true to the Pizza Express brand tagline of being stylish, creative and relevant. When developing the design, the team reverted its thinking and mindset back to that age of discovery and designed a space that is welcoming and cool to be seen in. “We wanted to design a space that relates to the constant and chaotic life of students. In aiming to evoke a feeling of intrigue, discovery and experimentation, the design sparks the curiosity of students through the use of a show kitchen, as most Pizza Express restaurants do,” Hasan tells ABDULAZIZ KHATTAK of Gulf Construction magazine. A combination of geometric wall patterns adorning the walls and the usage of diagonally striped floor tiles and coloured patterned timber wall strips are aimed to bring in a sense of fluid movement into the space. Mirrors, artwork, and neon signs are key elements positioned to identify directly with the students. Each corner has an educational component to trigger interest, such as the mathematical figure of Pi on a feature wall that subtly includes Pizza Express. 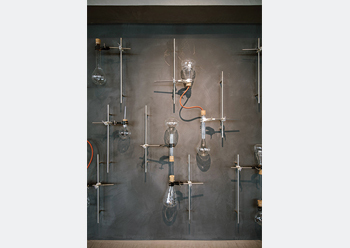 Wall lights in the shape of test tubes are used, along with a neon sign at the entrance spelling out ‘Food for Thought’ adding to the quirky features and details, while not taking away from the identity of Pizza Express. The convex mirrors represent the basic physics principles of reflection and refraction of light, which by extension is a design principle that H2R Design used quite literally to engage the target audience (students). “The concept behind the interior aims to channel the culture and attitude of university life. It is a space for thinkers and trendsetters. We wanted to create a space that fills their souls not only with the wonderful Pizza Express menu but also through the strategic use of design elements to capture their curiosity,” explains Hasan. Alamein Hotel ... designed in a modern boho-chic style while integrating the surrounding seaside environment. Furthermore, it was important for H2R Design to add the illustrative design ideas and to ensure that the features of the restaurant cater to a variety of demographics, whilst keeping an equal level of sophistication, says Husain. The show kitchen had to be carefully designed adhering to mall restrictions, minimising the visibility of cooking equipment. This created the opportunity to skew and rotate the kitchen and angle it within the space, allowing the team to configure the restaurant into zones. The bar counter is an architectural feature that opens up the serving area, welcoming diners to walk through. It adds dimension to the open space, similar to the geometric and dynamic feel of the wall patterns. The counter creates an angle in the space that references the dynamism and complex routine of students. Husain says H2R Design wanted the seating to appeal to the inquisitiveness of the students by allowing them to explore the variety of seating ranging in comfort and sturdiness. Diners are invited to walk through the space, adding to the theme of curiosity – and encouraging them to find the ‘it’ spot. H2R Design has also recently completed the grand renovation of Egypt’s celebrated Alamein Hotel. 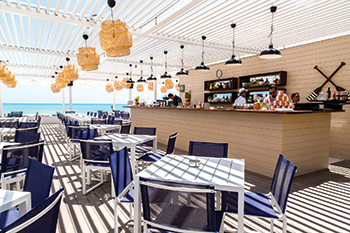 The design team remodelled the 1960s Mediterranean beach hub’s interiors, creating a serene escape infused with premium furnishings to elevate the hotel stay experience. A project that was full of challenges and complexities also proved to be one of H2R Design’s most rewarding assignments, says Hasan. The Alamein Hotel restoration project was spearheaded by Emaar Hospitality. The resort and residences feature 190 rooms including luxury chalets, seven suites and two presidential villas. Located on the Egyptian northern coast seaside, it has been frequented by celebrities, artists and bohemians throughout its 50-year history. H2R Design was insistent on keeping the cultural context and heritage in its design strategy. However, it wanted to rejuvenate and create a modern boho-chic style while integrating the surrounding seaside environment into the nature of the property. The design theme for the project was a ‘retro refurbishment’ including contemporary interiors, which paid subtle tributes to the glory days of when the resort first opened. H2R Design combined vintage styles conjuring the sense of nostalgia to the golden age of Egyptian music and cinema and added references to the famous guests the hotel has hosted. “Throughout the property, we wanted to create a sense of refined classics and translate that through materiality, the furniture pieces, fixtures and equipment. We used clean lines layered with textures to bring a modern mid-century experience and comfort twist to the mesmerising vistas,” says Hasan. In order to achieve a blend of vintage charm and contemporary elegance, H2R Design used a lot of natural white-washed timber, light and breezy elements reflecting the coastal region, and fabrics and upholstery suitable for the beach environment. The colours were meticulously selected to complement the natural landscape (muted blues, light greys, off whites and accents of deep blue to reflect the ever-changing colour of the sea). Metal was also used as an accent, adding elegance to the joinery, furniture elements and lighting. • Reception and lobby: As the most prominent space in the hotel, H2R Design instilled the wow factor for returning guests to actually feel the ambiance and experience in their first impression. The prominent architectural features of the lobby include the welcoming central double-volume lobby colonnade and atrium, to help achieve the design focus of opening up the vistas and views. • Rooms and suites: The guestrooms were designed to show the heritage of the hotel, refined with a soothing colour palette and furniture pieces to immerse the guests in tranquility. “Alamein Hotels has been open since the 1960s and throughout its existence has had a prestigious and loyal guest following. We intended to retain these guests and also revive their experience while encouraging a new generation of visitors. When transforming the hotel from the day-to-night scenarios, we focused on maintaining a welcoming and intimate ambiance that would instantly make guests feel at ease,” explains Jacqui Shaddock, partner at H2R Design. The renovation posed some challenges for the team, as the resort was fully occupied when the work began. Given the antiquity of the build, accurate drawings of the site were not available and records of the many ad-hoc architectural changes were no longer available. The structure was unclear until demolition commenced, and the H2R Design team had to constantly adapt the design (almost daily) to suit new the discoveries on the site, Shaddock says. As promoters of sustainability, H2R Design hired local contractors, manufacturers and suppliers to reduce the carbon footprint. The team took care of all the technical details while working closely with the project architects, hotel operations managers, and subcontractors, making sure all local standards were implemented.